You can download your favorite articles to your devices for later reading. With Offcloud, we ensure that your most precious asset, namely your time, is used efficiently, so that you can concentrate on things that matter most. Offcloud enables you to save the most interesting blogs and articles online and export them to your mobile devices. Offcloud is smart enough to detect the main content of your pages, extract and structure it into a clean and easy format that is suited for a variety of browsers. This ensure you have an enjoyable reading experience on all devices. Offcloud enables you to save your favorite articles to your cloud storage service, like Amazon or Dropbox, so that you can easily access and read them from any device and location. With Offcloud’s special extension for Google Chrome, you don’t even need to leave the page to have it converted. You can just right-click on any number of links and Offcloud will take care of the rest, using its dedicated servers and broad bandwidth. 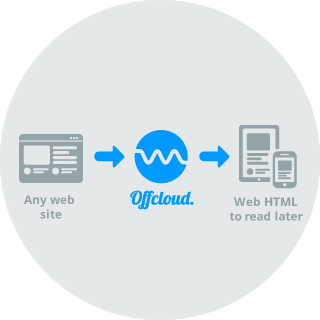 You can use Offcloud to convert webpages to pocket HTML for FREE. With a free account, you can download and convert up to 3 links. Then, you can enjoy the service without any restrictions for just $9.99 per month.